Looks like AlfaFinancials.co.za is NOT related to AlfaFinancials.com. AlfaFinancials is a forex broker. 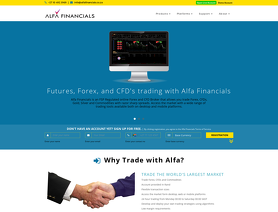 Alfa Financials offers the ALFATRADER DESKTOP forex trading platform. AlfaFinancials.co.za offers over 35 forex currency pairs, stocks, indices, cfds, commodities, gold and silver for your personal investment and trading options. Alfa Financial is South African brokerage with a truly global reach. To trade forex successfully you need to act fast, and anticipate changes in exchange rates. Alfa Financials gives you the tools to do just that. Clients can access Forex trading markets online through their powerful online trading platforms. This includes the AlfaTrader Desktop platform and mobile trading apps for Android and IOS devices.And I really appreciate their customer support system. FPA review Moderation Team Note: Even when posting as a representative, you keep saying things like "And I really appreciate their customer support system", just like in the fake client review you left. The FPA recommends that AlfaFinancials find a new representative. Helen should appreciate the employees at Alfa Financials, since she's one of them. She's also got an address with PrideHolding.com, which is somehow affiliated with Alfa Financials. She not only left this fake client review, she also spammed for Alfa Financials using the private messaging system in the FPA's forums. The FPA does not apporeciate forum spammers. The FPA does not appreciate review spammers.